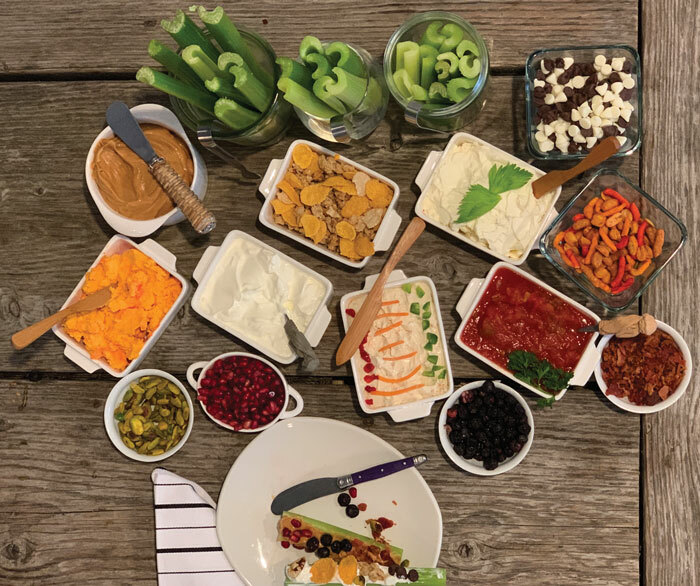 This issue of Lake Life magazine provided a challenge for me to incorporate the three themes of Winter Games, Weddings and Wellness into my recipes. At first, I let out a deep sigh. It’s winter people! Don’t you know? The time of year I hibernate and I just want to bake high calorie items that would be unacceptable for a wedding or a Winter Games party. Actually, I will confess, during this time of frigid temperatures I eat Cheetos, Lunchables, chilled peaches, and Cuties (those tiny little seedless California Clementines that are only available for a short period during the winter). I am single, hate leftovers and don’t like to cook for one or eat by myself. I hate to admit that my couch has become my dining table. I binge on books, Acorn, Netflix, and Tuner Classics, plus I go to the movies. I LOVE GOING TO THE MOVIES ANYTIME OF THE YEAR! Back to the recipes. I meditated on it and ding, ding, ding! I came up with three amazingly easy and super delicious recipes. All three are befitting for any type of wedding venue/theme, Winter Game gathering and are healthy. But the best part about them is that they are sooooo good. I did lots of taste-testing with friends, and random people off the street, to get feedback on what they liked and what could be improved upon. 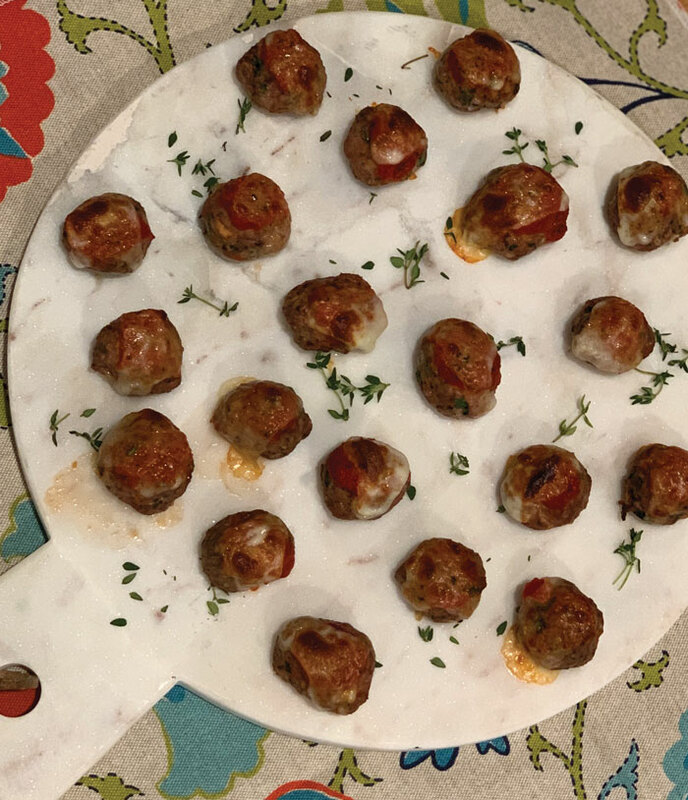 My favorite is the Chicken Meatball with Italian Sauce which is healthy and great as an appetizer or even a meal, depending on what size you make them. Celery Bar. The sad and lonely forgotten vegetable on the relish tray is transformed into an inviting appetizer for your Winter Games Bash or a posh hors d'oeuvre for a Wedding reception. Not only will these tidbits taste scrumptious, they rate high on the healthy choice scale. Union Square Cafe's Bar Nuts. These are the most addictive snack I have ever made. They actually originate from the famous cafe in New York City. The raw nuts are eaten warm and are seasoned with a smidgen of sweetness. This snack is hearty enough for a group of snowmobilers on a break during the Winter Games. It is a great way for them to warm up! Yet, these make a wonderful addition to a wedding cocktail hour. It will be something new and different that will have your guests requesting the recipe. And raw nuts, as we all know, are a great addition to a health conscious diet. This is my 25th year of living at the Iowa Great Lakes. The first winter is still so vivid. Walking on the ice, learning about ice shacks, Burning of the Greens, fireworks, dog sled rides and more. Every year since, there have been new and different activities. The weather is never the same from year to year, which provides some unique opportunities and challenges. I still find it magical to live here and enjoy the history, nature and cultural environment. The water is my passion and I am committing to spend more time connecting with it in 2019. Wash and trim celery. Cut into various lengths from 4-8 inches. A quick and easy snack for your Winter Games Weekenders that has lots of fiber and is low in calories. For a casual setting, place celery in various sizes of clear glass jars with small tongs. Use small bowls for the fillings and toppings. 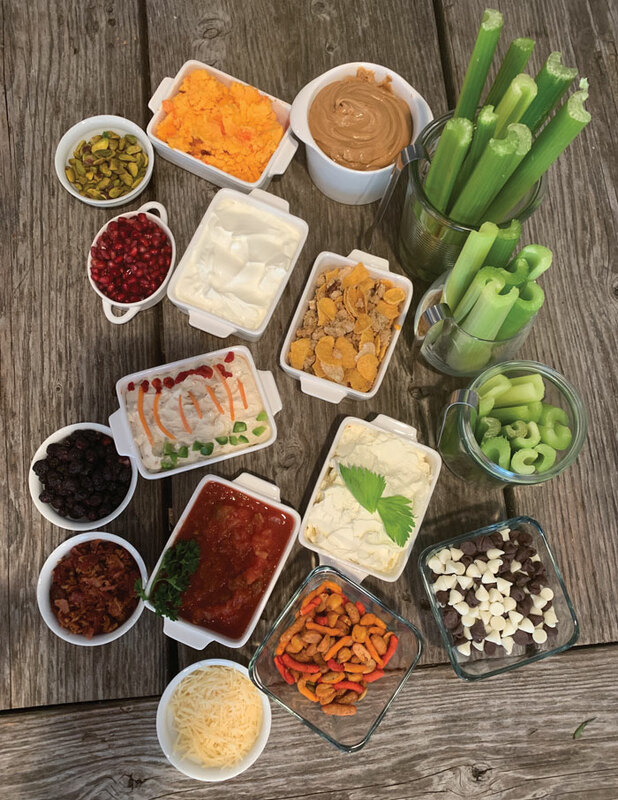 Your guests will have a blast making their own signature celery snack. 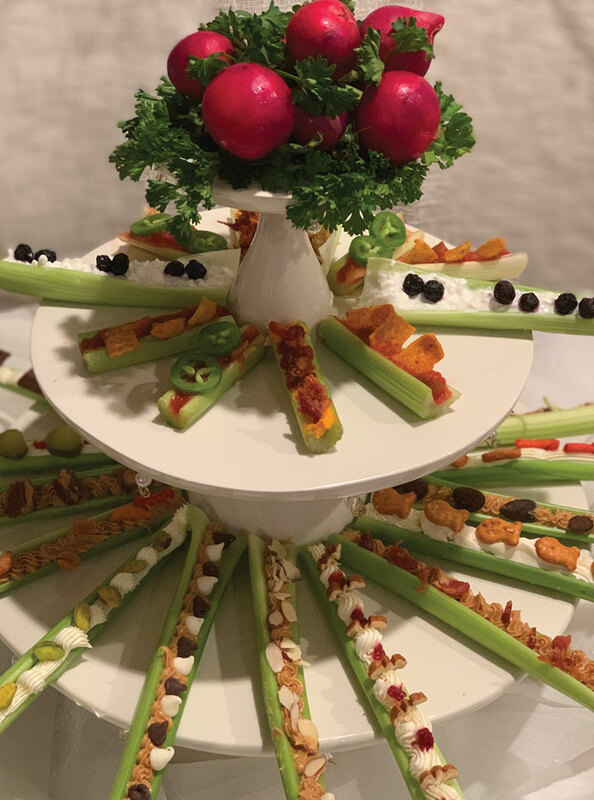 Add some fun and conversation to your event by surveying your guests on their celery combinations’ and ask them to give them a name. 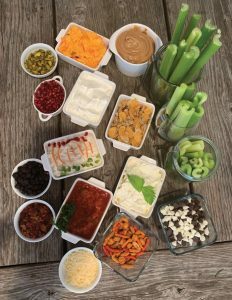 For a larger or more formal setting, such as a wedding, I recommend filling the celery, adding the toppings and arranging on a platter for serving versus setting up a self-serve bar. If desired, you could pipe the cream cheese and creamy peanut butter with a cake decorating kit. Take extra care to garnish them for that extra special touch. You will be pleasantly surprised how quickly the celery nibbles will vanish from the hors d'oeuvres table. Be creative and come up with your own personal favorite! Preheat oven to 350 degrees. Spray a baking dish with cooking release spray. Combine ground chicken, Parmesan cheese, 2 T sauce, basil, thyme, fennel, sea salt, pepper, onion, and parsley. Form chicken mixture into 8 even balls for large appetizers and 12 for small appetizers. Bake for approximately 25 minutes. Spoon ¼ cup of sauce over meatballs. Top each meatball with a cheese slice. Broil for 2 – 3 minutes. Serve warm or at room temperature. Move over beef and pork. These chicken meatballs are moist and deliver a new taste palette of herbs and cheese that are the perfect combination. Topped with a smidgen of Italian sauce and mozzarella cheese assists in keeping the calorie count down. Serve the larger portions at your Winter Games party. They can be made ahead of time, frozen and baked before your event. Then just add sauce and cheese and broil for a minute or two and they are ready to serve. Do you have an upcoming wedding? Chicken Parmesan Meatballs are wonderful as an entree or an appetizer. Also great alongside a pasta bar. 1 1/4 lb Assorted Unsalted Raw Nuts: Cashews, Brazil Nuts, Hazelnuts, Walnuts, Pecans, Whole Unpeeled Almonds and Peeled Peanuts. Spread nuts evenly on baking sheet and bake for 10 minutes or until they become light brown. While the nuts are in the oven, combine the rosemary, sugar, salt, cayenne and melted butter in a large bowl. When the nuts are done, immediately toss them in the rosemary mixture until they are evenly coated. They taste best served warm, but can also be served at room temperature. This recipe is my take on one I had read about in a travel magazine several years ago. I was able to find the 1994 out-of-print cookbook, “The Union Square Café Cookbook: 160 Favorite Recipes from New York’s Acclaimed Restaurant”. The café is the originator of this amazing yet easy recipe. These nuts will be a hit during the Winter Games Weekend. Serve them with craft beer, wine or hot chocolate. Looking for something new and different for the cocktail hour as you are planning your upcoming nuptials? 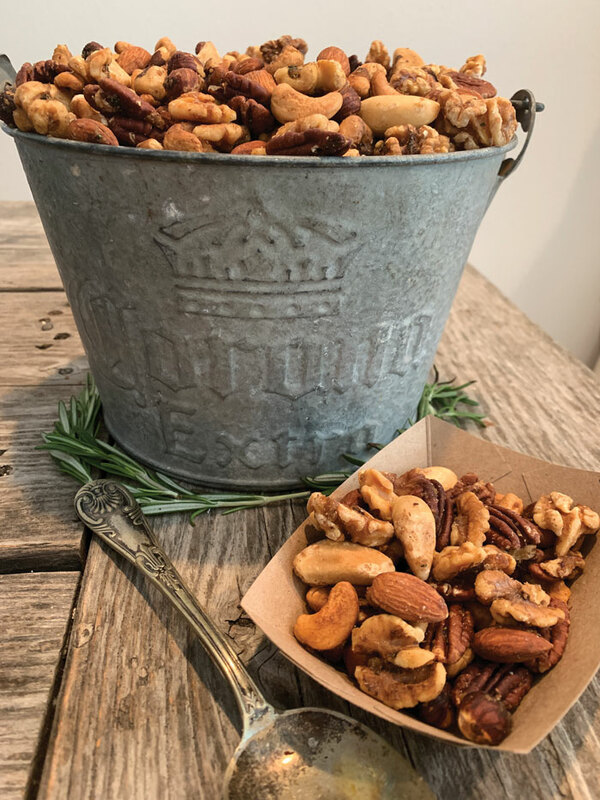 Include these fresh, rosemary infused nuts on the reception tables or in a “to-go” treat bag for your guests. In general, nuts are great for your health. Great source of protein, fiber and heart healthy fats. Be aware of too much sugar and salt. Almonds usually fare the lowest in calories.